And how this metamorphosis saves Monkeys! Colombia: a beautiful country, with incredible forests and diverse wildlife, but like many other countries, a trash problem. With no formal trash collection system, the forests and villages suffer from scattered plastic bags, endangering wildlife and creating a mess on village streets. One such village was Los Limites, until they came up with a most transformative solution: Eco-Mochilas! The Eco-Mochila project was invented by the organization Proyecto Titi (Project Tamarin), a dynamic conservation program that combines field research, education, and community programs in an effort to protect the endangered Cotton Top Tamarin. 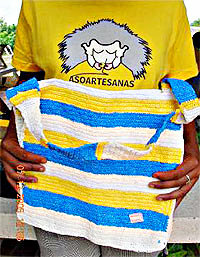 An Eco-Mochila is a bag made from crocheting 100 plastic bags into a colorful beach bag or purse. The innovative woman who create the bags are called the Asoartesanas. 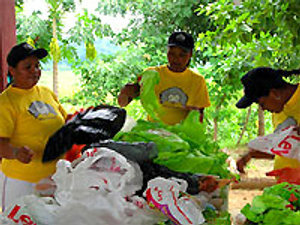 They encourage villagers and school children to collect plastic bags and as they go door to door to collect, they educate the people about their local wildlife. Then, they cut the bags into strips and begin their craft. Eco-Mochilas are sold throughout the world at various venues and bring in a suitable salary for an artist. Of course, the collecting of thousands of plastic bags has other benefits: a more beautiful village, and a forest clear of trash, which makes a certain one-pound monkey very happy. The endangered Cotton Top Tamarin is found only in the forests of Colombia. Deforestation and capture for the pet trade are the species’ greatest threats. The Eco-Mochila project creates sustenance for villagers, an alternative to using the forest for such, and of course, offers a cleaner forest for all wildlife. And in case this is important to their case, eco-mochilas are cute, come in different sizes, can be personalized, make great presents and are water resistant. I have three! Click here to purchase an Eco-Mochila and help Cotton-Top Tamarins; and come visit the Tamarins at the Oakland Zoo anytime. Plastics are classified based on their polymer backbone. Just as there are many varieties of plastic, there are several different ways to process plastic. Most plastic bags consist of carbon, nitrogen, oxygen, sulfur, or chlorine.